10.1 Alfred Wegener – the Father of Plate Tectonics The evidence for continental drift in the early 20th century included the matching of continental shapes on either side of the Atlantic and the geological and fossil matchups between continents that are now thousands of kilometres apart. 10.2 Global Geological Models of the Early 20th Century The established theories of global geology were permanentism and contractionism, but neither of these theories was able to explain some of the evidence that supported the idea of continental drift. 10.3 Geological Renaissance of the Mid-20th Century Giant strides were made in understanding Earth during the middle decades of the 20th century, including discovering magnetic evidence of continental drift, mapping the topography of the ocean floor, describing the depth relationships of earthquakes along ocean trenches, measuring heat flow differences in various parts of the ocean floor, and mapping magnetic reversals on the sea floor. By the mid-1960s, the fundamentals of the theory of plate tectonics were in place. 10.4 Plates, Plate Motions, and Plate-Boundary Processes Earth’s lithosphere is made up of over 20 plates that are moving in different directions at rates of between 1 cm/y and 10 cm/y. The three types of plate boundaries are divergent (plates moving apart and new crust forming), convergent (plates moving together and one being subducted), and transform (plates moving side by side). Divergent boundaries form where existing plates are rifted apart, and it is hypothesized that this is caused by a series of mantle plumes. Subduction zones are assumed to form where accumulation of sediment at a passive margin leads to separation of oceanic and continental lithosphere. Supercontinents form and break up through these processes. 10.5 Mechanisms for Plate Motion It is widely believed that ridge-push and slab-pull are the main mechanisms for plate motion, as opposed to traction by mantle convection. Mantle convection is a key factor for producing the conditions necessary for ridge-push and slab-pull. List some of the evidence used by Wegener to support his idea of moving continents. What was the primary technical weakness with Wegener’s continental drift theory? How were mountains thought to be formed (a) by contractionists and (b) by permanentists? How were the trans-Atlantic paleontological matchups explained in the late 19th century? In the context of isostasy, what would prevent an area of continental crust from becoming part of an ocean? How did we learn about the topography of the sea floor in the early part of the 20th century? How does the temperature profile of the crust and the mantle indicate that part of the mantle must be convecting? What evidence from paleomagnetic studies provided support for continental drift? Which parts of the oceans are the deepest? Why is there less sediment in the ocean ridge areas than in other parts of the sea floor? How were the oceanic heat-flow data related to mantle convection? Describe the spatial and depth distribution of earthquakes at ocean ridges and ocean trenches. In the model for ocean basins developed by Harold Hess, what took place at oceanic ridges and what took place at oceanic trenches? What aspect of plate tectonics was not included in the Hess theory? The diagram here shows the pattern of sea-floor magnetic anomalies in the area of a spreading ridge. Draw in the likely location of the ridge. What is a mantle plume and what is its expected lifespan? Describe the nature of movement at an ocean ridge transform fault (a) between the ridge segments, and (b) outside the ridge segments. How is it possible for a plate to include both oceanic and continental crust? What is the likely relationship between mantle plumes and the development of a continental rift? Why does subduction not take place at a continent-continent convergent zone? 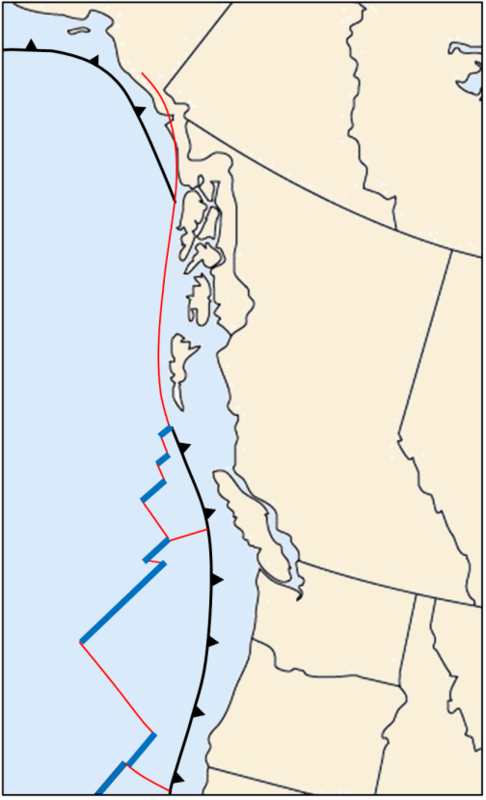 On this map of the west coast, divergent, convergent, and transform boundaries are shown in different colours. Which colours are the divergent boundaries, which are the convergent boundaries, and which are the transform boundaries? Name the plates on this map and show their approximate motion directions. Show the sense of motion on either side of the plate boundary to the west of Haida Gwaii (Queen Charlotte Islands). Where are Earth’s most recent sites of continental rifting and creation of new ocean floor? What is likely to happen to western California over the next 50 million years? What geological situation might eventually lead to the generation of a subduction zone at a passive ocean-continent boundary such as the eastern coast of North America? Chapter 10 Summary by Steven Earle is licensed under a Creative Commons Attribution 4.0 International License, except where otherwise noted.